Lightning is nothing to be laughed at, but it’s a heck of a lot of fun in small packages–well, maybe not to those on the other end of a static shock. The same is true of Jack Everitt’s cool app, Volt. It’s lightning, contained in your iPhone to be unleashed on unsuspecting victims. To utilize it, just tap the screen: a bolt of lightning will spring from the sphere in the center to your fingertip. Volt can handle up to three fingers; no more bolts will appear after that. You can also customize the look of your lightning bolts, and even the size of the sphere. Tap the lightning bolt icon in the top right corner (you may have to shake the device to make the menu icons appear; shake again to make them disappear) and you can change the color of the bolts, the number of bolts, how much they should dance about, and how thick they should be. 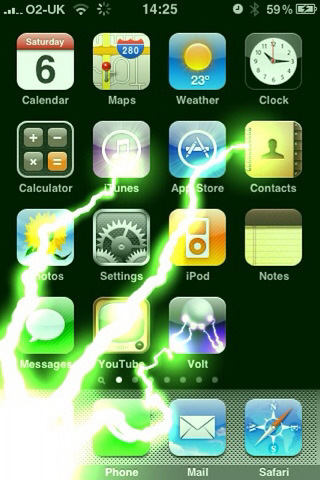 Tap the lightning bolt icon to enjoy the results. A fun little change is to switch the background to one of your photos. Your finger then becomes the sphere, and however many lightning bolts you specified will spring forth from it randomly to tickle the photo. If there’s a particular combination of settings you enjoy, you can tap the camera icon at the very top, middle of the screen: that will take a screenshot of whatever is displayed at the moment. These make for awesome, one-of-a-kind wallpapers. The amazing graphics are completely front and center of this app, no question. No matter what you do to customize it, the lightning bolts are never fake or hokey; every little bit of it is realistically rendered, right down to the very last spark. (The randomization itself must’ve been a hoot to develop.) This is compounded by the electrical sounds and vibration (latter available for the iPhone only) that activate whenever you touch the screen. Unfortunately, aside from being something to marvel over, there isn’t really a huge use for the Volt app. Once the element of surprise wears off, the novelty soon does as well. Then again, it might be worth $0.99 just to keep something this fantastically pretty around. AppSafari review of Volt – 3D Lightning Unleashed From Your Fingertips was written by Julie Guan on May 11th, 2010 and categorized under App Store, Fun. Page viewed 5960 times, 1 so far today. Need help on using these apps? Please read the Help Page.